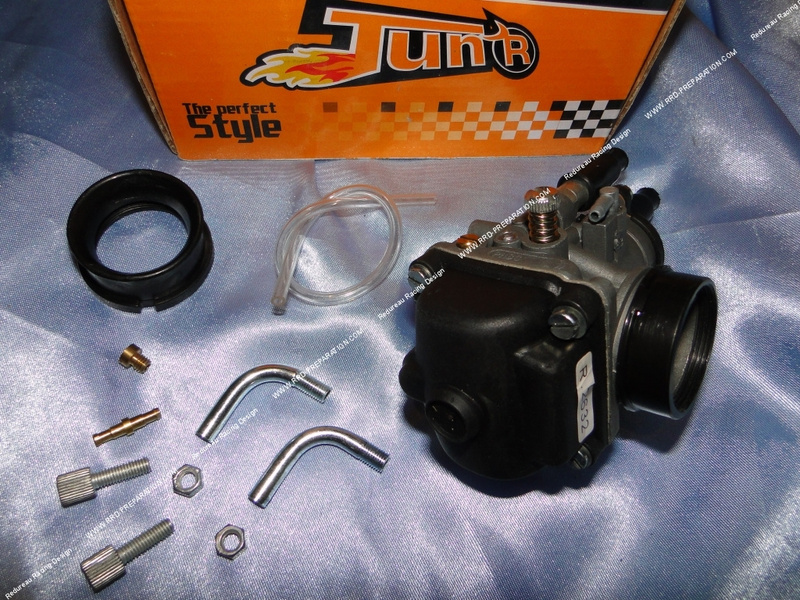 Very complete, here is the kind carburetor PHBG home TUN 'R, this model has 2 21mm intake tulips (a 40mm and a Ø35mm), so you can ask the air filters without Ø33mm tulip and Ø35mm 40mm. It also comes with the right tubes, but also angled at 90 ° for cable choke and throttle. This is a copy of 2632 (PHBG 21 DS) in DELLORTO but it must be clear, it is far from offering the quality and performance of DELLORTO, it is both cheaper and more complete! This carburettor is a flexible mounting, mounting on pipe Ø admission of Ø25mm. His starter is a cable and it has the separate lubrication, it comes with a nozzle, an outlet of depression or oil, 2 tulips and elbows 90 ° and more rights.